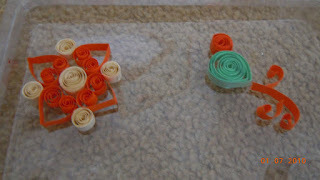 I am obsessed with quilling now a days.Made two simple designs for beginners. One is a bird and other is a simple quilling design. I made these quilling designs after putting my kids to bed. It is totally impossible even to think about doing any quilling while my little one is awake. He is 9 months now and very active. My daughter likes to do anything and everything. She is much interested in 'make-it' activities. I bought her a groovy gift kit today. She wanted to make things right away.She has lots of ideas where creativity is concerned and she is only four and a half years.